The numbers continue to grow. 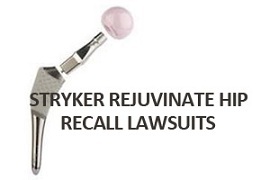 The number of complaints filed in state and federal courts by those who have experienced problems with the Stryker Rejuvenate hip replacement is nearing 1,000. With DePuy hip cases reaching a settlement last month, the focus on these claims is going to intensify. This post talks about where these cases are going and makes a prediction of how and when these cases will settle. Removed from the market less than two years after the design was introduced, Stryker Rejuvenate and ABG II hip systems began to fail within a few years of implantation, as opposed to the 15 to 20 years they were expected to last. Traditional hip implants consist of a single femoral component. The Stryker Rejuvenate and ABG II models are modular neck-stems that consist of two pieces that fit inside of each other, allowing the surgeon to customize the length of the femoral component. It was discovered that the rubbing of the neck and stem can release microscopic metal debris into the body as the chromium-cobalt neck rubs against the titanium femoral stem. This past June, a Multi-District Litigation (MDL) was created in which all complaints filed in U.S. District Courts nationwide are centralized for coordinated pretrial proceedings before one Judge. According to an updated list, there are currently at least 395 cases centralized in the Struker Rejuvenate MDL. An MDL is created to reduce duplicative discovery and avoid pretrial rulings from different judges. A state equivalent of the MDL was created, called Multi-County Litigation (MCL), and consists of a large number of cases that have been filed in New Jersey, state headquarters for Stryker. At last count, there were at least 553 Stryker Rejuvenate or ABG II lawsuits that have been centralized. It is expected that a small group of cases will be prepared for trial. These cases, known as bellwether cases, are basically test cases. They allow the parties to see what a jury will do with a garden-variety claim so they can decide where they stand. Bellwether cases are often precursors for settlement talks and may facilitate further negotiations. We try a few of these cases. Plaintiffs knock the ball out of the park because juries will see these cases for what they are. The cases settle for more than the DePuy cass. One thing is definite though – the lawsuits are going to keep coming. Only 5% of patients who received the defective hip implant already having brought a lawsuit. So there are lots more coming. If you believe that you or a loved one may have a claim, please reach out to one of our attorneys. We may be able to help you get the compensation you really do deserve. Call us at 800-553-8082 or get a free online consultation here. Problems with Metal on Metal?